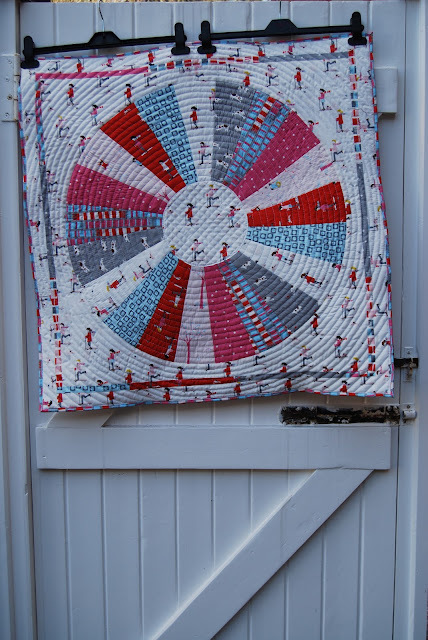 Fancy quilting along with Lily's Quilts? Well here's a sneak peek of what's planned. I've made a sample block into a mini quilt. 30" square. Six of these make a quilt 60" X 90". More information coming shortly including fabric requirements, button for your blogs, timetable and plans for guest bloggers, linky parties, bloglists. The idea behind the QAL? To get as many people as possible involved from complete beginners (who will have their own simpler version if they like) to advanced quilters who may choose to adapt and make their own "take" on this quilt. And to have fun. To forget about being perfect quilters. To get rid of the feeling some people have that they aren't good enough to join in with swaps and bees and quilt-a-longs. So I'd love as many as possible of you to quilt along and to quilt at your level, whether that's beginner, imtermediate or advanced. Share successes and failures, hints and tips, ask stupid questions and possibly get stupid answers. Share blog links and chat about how you're doing. All this and more will follow tomorrow. If you're in, leave your blog details in a comment and we'll get a blogroll going - and go and join the Flickr group if you haven't already. Lynne, I would love to join your qal! I've never done one before and one of my goals for the year was to make a whole dresden quilt. So excited, eeep! Now to choose my fabrics .... Maybe crush again? haha! Sounds great! I always wanted to try Dresden Plates. This block looks similar. I think this will be fun :) Can't wait to get started! Holy crap, that'll look amazing!!! I even have fabric - I've been collecting for a "me" quilt and awaiting the perfect non-fussy COOL pattern (I thought about another hexagon park one!) but this is the one!!!! I haven't finished my circle dresden quilt yet that I started last year so unless I get a sprint on with that I might struggle to keep up with another one. I may however cope with a mini version :) One to think on. I am curious how fast this one will move. Work is very time consuming these days and as much as I would like to play the commitment scares me a little. Can you tell me the speed at which this will move? OMG, it is BEAUTIFUL!!! I love the Sherbert Pips but this is by far the best quilt I have seen in Sherbert. Looks very interesting and love that block!! but I also wonder about the timelines with everything else I have going on.. I'm really interested, but I'm moving across the country in about eight weeks...so I'm not sure I can participate...maybe I'll have to bookmark it! So cool! I'm looking forward to seeing the fabric requirements and the timetable! I'm finishing up a quilt and in the beginning of another one, so I hope I can make time to participate!! I'd love to be in !! I may only go as far as one block for a mini quilt - I have so much work at skool at the moment, what with coming up to university entrance, exams and all ... but if that's ok ... Yay!! I'll quilt along with you. Making a circle has been on my list for a long time. Maybe you could have the pro quilters on the A side, and the numbnut quilters on the B side? O my gosh I think I'm in love. There are so many cute projects with this fabric, I don't know where to start! I look forward to seeing more information on this project - this one just might win first since I've never made a block like this before and have been wanting to. I don't have a blog for your blogroll, but I'm gonna join anyway. *S* All kinds of stuff here I've not tried. Thx for a nice new modern idea to work with. I definitely want to join! I've been wanting to do a QAL for a while. My blog is elsasfineline.blogspot.com. I haven't blogged in a while now but that can change at any moment! I'm away for a sewing retreat this weekend (Thursday to Sunday) and won't have a computer. But I'll definitely check in on Monday! I'm going to have to skip this one because of vacation, but would like to join your next quilt along. I love your quilts! Wow! I wasn't expecting something like this! I admit to feeling a little overwhelmed looking at it. Dresdens and circles are both on my Things To Try in 2011 list, so I guess I'm in! Great block....wonderful thing you are doing here!!! Oh I saw the perfect inspiration block for my color scheme this morning! Oh, I like it! I am in! Wow, I absolutely love this - especially with Sherbet Pips! I don't know if I'll join this time because I have too many projects on my hands right now, but I'll still follow along to see everyones' progress! Or, maybe I'll change my mind and join. Haha. Oooooh, I'm excited about this! It will be my first quilt, though I have been basting hexagons for the last couple of weeks. But this will be my first finished quilt because I'm expecting my hexes to take about eight years. I can hardly wait to go fabric shopping! Your little quilt is adorable. Love the quilting. Am more and more intrigued by the Pips. Thanks for letting me know about this :o) I'm definately thinking about it but am a little nervous! I'm interested as well and wondering about time lines etc.... Love the Sherbet Pips in this pattern and it looks very fun! oh, I'd love to join, it looks great! And I think I would be brave enough to try the pieced circle. I'm just not sure if I have enough fabric for it right now. I LOVE that mini! To have a big one will be awesome!! Can't wait to get started! I think I already know what fabric I will be using too! It looks great. I think I'm in. Who's Dan (Made by a Man)? Besides having the coolest blog name, I need to meet more man quilters...see look at all the great stuff happening right here at Lily's Quilting! New friends! QALs! Flikrgroups! I've got vacation around the corner, so my participation may be on the delayed side, but I'm here for you pal!! I love the GIANT blocks! That alone is enough to sign me up. Forgot to leave my blog info. I already have some ideas for this one, thinking maybe a rainbow effect. I'm in. I want to join in! I haven't done a QAL in awhile now. I'm trying to use up my stash so must work with what I have.